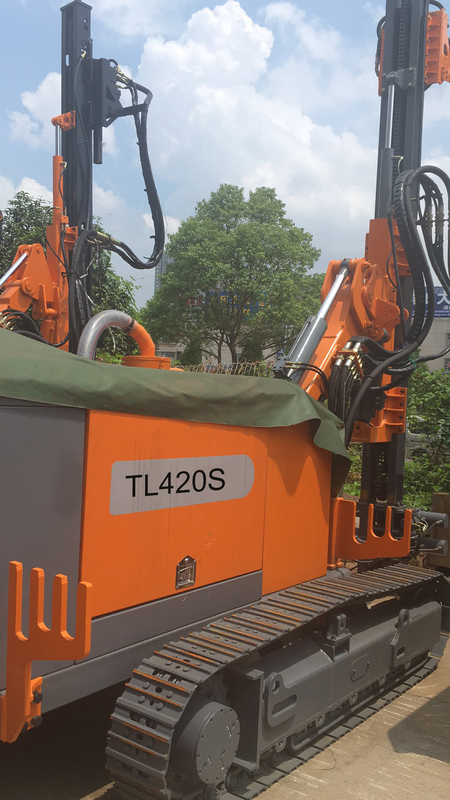 HM-TL420S series anchor drilling rig is a high efficiency drilling rig mainly for anchoring, jet grouting and dewatering. This series drilling rig is all hydraulic operated drill in accordance with the requirements of subway, high rise building, airport and the other deep foundation pit. 1.Non-cycle liquid dry auger drill. 2.DTH hammer with tube drill in broken rock area by air. 3.Mud circulation drill in sand soil layer. 5.Complex rod and casing drilling. 6.Single, double, triple tube, swing jet and fixing jet. anchoring, jet grouting and dewatering, subway, high rise building, airport and the other deep foundation pit.